It's finally here, after a couple of days of buildup I am finally sharing what I did with the carrot cake cupcakes and caramel buttercream. Besides eat the of course, but that goes without saying! My first cupcake cake experience was last year about this time. I made a lamb cupcake cake in honor of Mimi's little lamb. It would be another fun Easter option! After making that one, I was hooked. What a fun way to decorate and serve dessert. So when Little Dude wanted a Grinch cake for his birthday, I went back to the cupcake cake idea. It was the only way I could envision it with my limited decorating and artistic abilities. 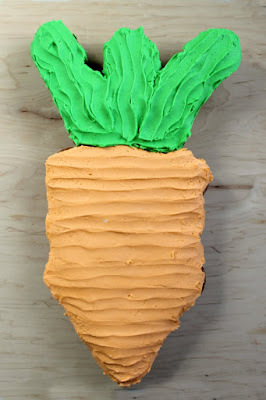 When Pops requested a carrot cake recently, I immediately had visions of this cupcake cake dancing in my head. I am so glad I followed that whim! If possible, you'll want to bake 8 cupcakes in green cupcake liners and 12 in orange cupcake liners. If not, it's not a huge deal, but it adds to the fun! 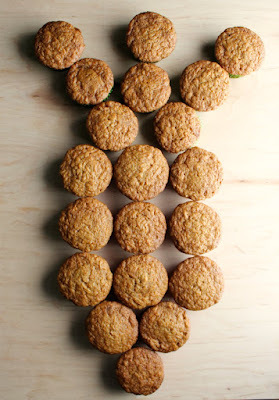 Start by arranging your twenty cupcakes in the shape of a carrot. 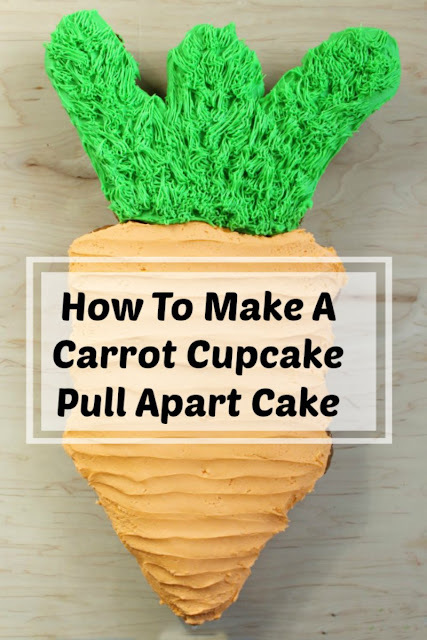 Start with one for the tip of the carrot, then widen out to a row of two cupcakes. Next make three rows of three cupcakes. Followed by two to start the fronds. Arrange six more in three columns of two with space between them for the greens. Cupcake cakes take a lot of frosting (yippee!) It takes extra to help fill the gaps. 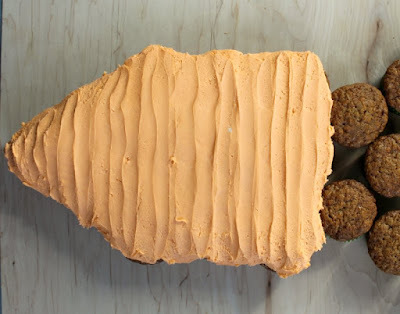 So, make two batches of caramel buttercream. Dye about 2/3 of the frosting orange and the other 1/3 green. I like using gel food coloring to make that easy. 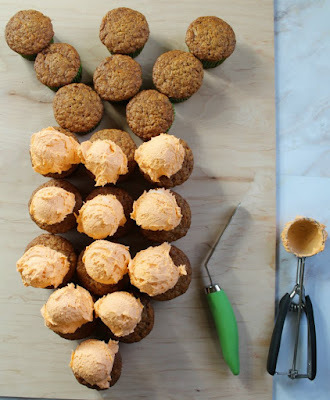 Using a large cookie scoop, place a scoop of frosting on each of the lower "carrot" cupcakes. Then spread it out over the cupcakes. It doesn't have to be perfect at this point, you just want to make sure the gaps are filled and you have the general shape going. 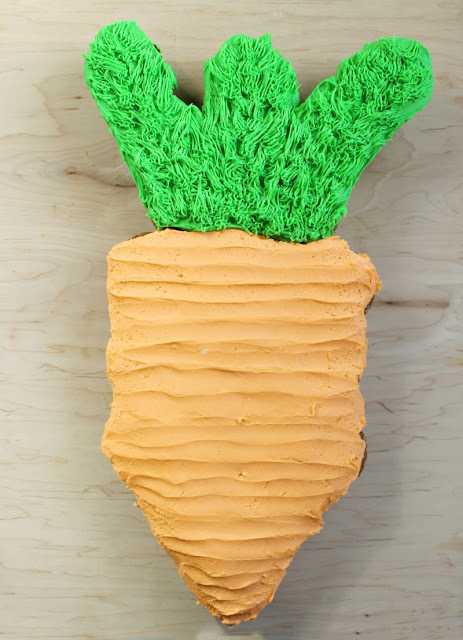 Using a small offset spatula, or knife make small indentations across the frosting for the lines on the carrot. 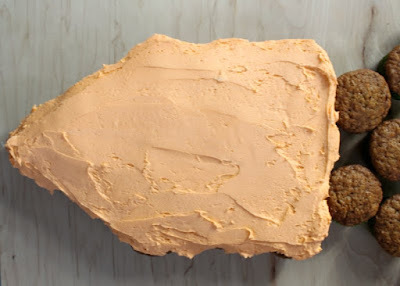 Just use light pressure and drag the tip of the spatula across the frosting. 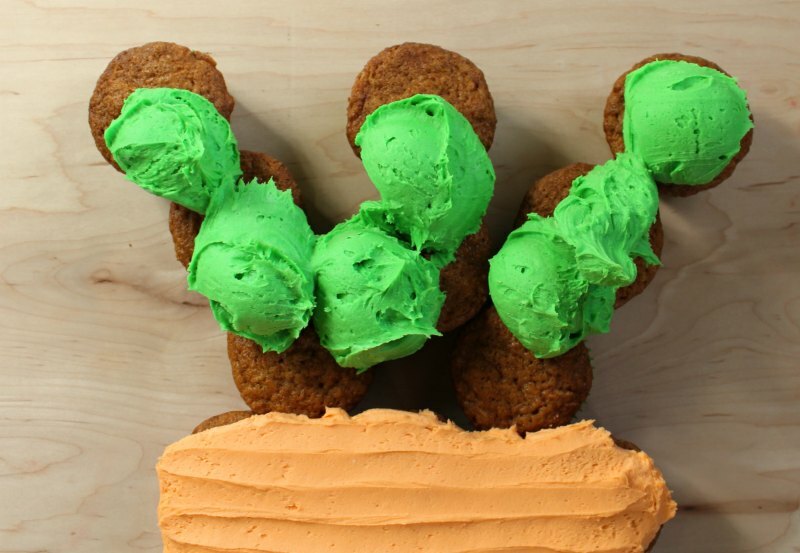 Now scoop green frosting onto the "frond" cupcakes. 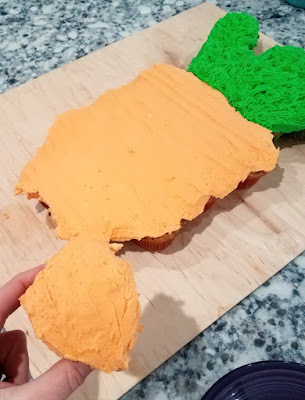 Make sure to get a little extra in the gap between the carrot and those first two green cupcakes. Again, using an offset spatula, smooth the frosting. Then, you can drag lines upwards, starting at the top of the carrot towards the top of the greens. Or, if desired, you can use a grass tip to pipe on some green fronds! Now enjoy the fruits of your labor! Carlee, these are perfection! Such a perfectly and yummy cute display for Easter. I bet little dudes eyes got big when he saw the finished product! He loves it when I make cupcake cakes and this was no exception! I ❤️ Your cupcake cakes! I feel like they would be a hit at all the parties! I think so too. They are so much fun to make too!